A Trip to Japan Brings Home the Message Resist! Article 9 of the Japanese Constitution has helped to keep the island nation of 27 million people at relative peace since it was passed in 1947. The text of Article 9 limited Japan to Self-Defense Forces without war potential and aimed for international peace based on justice and order. * After World War II the United States was charged with protection of Japan, and under the present mutual security treaty the U.S. continues to maintain and expand its military presence there. U.S. tax dollars fund over one hundred military bases in Japan. Seventy years after Japan’s cities were bombed and burned, its people vaporized under atomic blasts or living with the horrific effects of radiation disease, the U.S. military is expanding its reach through the transparent ploy of protecting Japan from North Korea and China. As part of the U.S. “pivot towards Asia”, these expanding bases constitute a serious endangerment to Japan. It took an August visit to Japan for this reality to sink in. At Ukawa Village a few hours north of Kyoto, our international Global Network Against Weapons and Nuclear Power in Space Conference delegation was warmly welcomed. 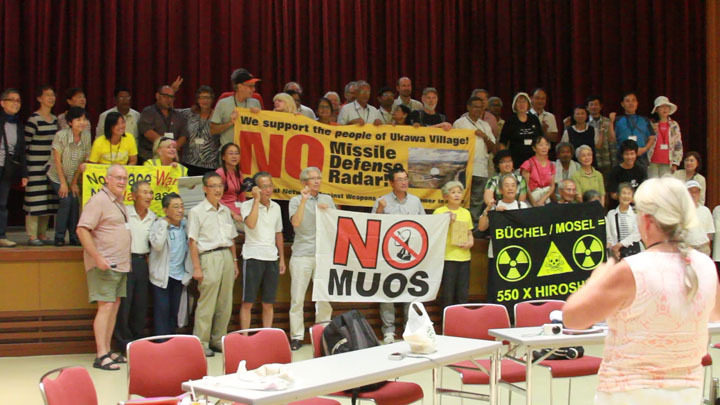 Local peace activists invited us to join in their weekly protests against the new X-Band Radar Station installed in northern Kyoto Prefecture under the U.S. missile defense system (MDS) — a visibly ugly sign of President Obama’s pivot. The Global Network Against Weapons and Nuclear Power in Space Conference delegation in Kyoto. As we joined the protesters at the base we could see the radar pointing out to sea and directly at China. Millions of U.S. tax dollars are being directed not at defending Japan from a Chinese threat, but at making the small Japanese fishing village nearby a direct target. As the MDS creates a first-strike capability, its location at this base and at many others in places like South Korea’s Jeju Naval Base at Gangjeong Village, directly threaten China and in turn, Japan. To add to that, villagers report deep concerns about pollution, environmental destruction, constant noise, increased car accidents, and other problems caused by American military personnel. Our group visited the Iwakuni Marine Air Station on the Inland Sea near Hiroshima and saw first-hand the geographic displacement of villagers, the blocking and pollution of waterways and harbors. Joining us on this visit were international delegates from the World Conference Against A & H Bombs, sponsored by the Japanese antinuclear group, Gensuiyko. They were meeting in Hiroshima and Nagasaki on the 70th anniversary of the atomic bombings of those cities. The delegates were peace activists from around the world who also actively protest at many of the 1,000 U.S. bases, including the Bussel Base in Germany, Menwith Hill in England, and bases in the Marshall and Marianna Islands. There were delegates from the U.S., including those protesting the East Coast Missile Defense plan, which could cost at least $3.5 billion over the next five years based on the same faulty premise of “self-defense”. I was struck by the realization that, among almost all of these people immersed in the fight against the “foreign occupation” of active U.S. military bases in their homelands, there was little integration of war tax resistance. If the governments that claim to represent us continue to refuse to redirect our taxes from war to peace, we must do it ourselves. For the peace movement as a whole, it is critical that war tax resistance be integrated into effective protest actions. Resistance is the missing piece. One opening for this integration may be Peace Action’s “Move the Money” Campaign. In Hiroshima, I was fortunate to meet Madelyn Hoffman, who was there representing Peace Action. On a sweltering evening, several of us took a break from conferencing for some coffee-house jazz. When the between-sets talk turned to war resistance, Madelyn spoke of a campaign that challenges the military/Pentagon budget and calls for Tax Day demonstrations. It makes a familiar plea to our government for a reduction in military spending, calling for 25% of the Pentagon’s money to be redirected to real national priorities and including specific legislative action by Congress to direct this effort. Perhaps as war tax resisters and redirectors, it is time for us to widen our appeal by calling on people to reduce their personal military spending by redirecting 25% of their income taxes themselves. Redirecting resisted taxes through personal choice or through an active alternative fund would add the weight of personal resistance to the campaign call for legislative reform. The war tax resistance network of Alternative funds are available to make these redirections real and to help force changes in U.S. spending priorities. I feel honored to have been in Japan during the Gensuiyko World Conference Against the A & H Bombs. To see the fierce dedication of the Japanese people to preserving their peace constitution, to closing American military bases, and to lifting up the humanitarian cause of the hibakusha (bomb-affected individuals) to abolish nuclear weapons forever, is both a humbling experience and a strong push towards continuing to resist the military madness loose in our world. Perseverance in resistance is our best hope. * Editor’s Note: In September 2015, and despite massive protests, the Japanese government passed legislation to “reinterpret” the Constitution and allow the Japanese military to participate in military actions with allies rather than sticking with humanitarian roles. Cathleen Deppe is active with Southern California War Tax Resistance and Alternative Fund and is a member of NWTRCC‘s Administrative Committee. My passion is peace and justice. 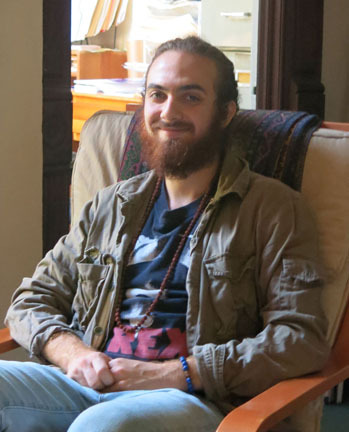 I study Peace Studies which includes environmental policy, religion and psychology. Through my life, I’ve always been fascinated by religion. Because of this desire to seek, I found myself to be opposed to all war, which I believe is the greatest problem of our world. This desire to end war has lead me from studying Reconstructionist Judaism to attending a Quaker boarding school, George School, where I solidified my beliefs as Conscientious Objector. I am now Buddhist. I interned for the Center on Conscience and War last summer, which brought me to NWTRCC. The IRS itself issued another warning memo about scams on August 6, 2015. It reports that the Treasury Inspector General for Tax Administration (TIGTA) has received reports of roughly 600,000 contacts since October 2013. TIGTA is also aware of nearly 4,000 victims who have collectively reported over $20 million in financial losses as a result of tax scams. The IRS has links at irs.gov to their memos and warnings and says that if you’ve been targeted by any scam, be sure to contact the Federal Trade Commission and find the “FTC Complaint Assistant” at ftc.gov. Add “IRS Telephone Scam” to the comments of your complaint. When asked about the consequences of refusing war taxes, we include “penalties and interest” on the debt as one factor. Many people ask how this will add up. The failure-to-pay penalty is 0.5% of the tax owed for each month or part of a month that the tax remains unpaid after the due date, up to 25%. The 0.5% rate increases to 1% per month if the tax remains unpaid after several notices and 10 days after the IRS issues a final notice of intent to levy or seize property. At 1% for a year the penalty would be $5 or a bit more if they are calculating the penalty on the original debt plus interest. Interest on unpaid tax is more difficult for most of us to calculate because it compounds daily from the due date of the return. The interest rate is the federal short-term rate (currently 3%, adjusted quarterly) plus 3%. You can go to the handy calculatecompoundinterest.com, and find out that one year of interest at 6% on $500 would total $30.92. Some callers report that they filed on time but the IRS added a late-filing penalty. This should be argued by calling the IRS number on the letter that shows the penalty. If you were late, the combined penalty is 5% (4.5% late filing and 0.5% late payment) for each month or part of a month that your return was late, up to 25%. If after five months you still have not paid, the failure-to-file penalty will max out, but the 0.5% failure-to-pay penalty continues until the tax is paid, up to 25%. Affiliate fees, support from alternative funds, and individual donations are a fundamental part of NWTRCC‘s durability. It’s been a bit dry the last few months, but we are grateful to those of you who have renewed your newsletter subscriptions and made contributions between summer activities. The Network List of Affiliates, Area Contacts, Counselors, and Alternative Funds is being updated this Fall. If you received a postcard in the mail, please return it or contact the office with any updates or confirmation of current status (nwtrcc@nwtrcc.org or 1-800-269-7464). The list online is being updated frequently at nwtrcc.org/contacts_counselors.php. Click here for our advertising rates or contact the editor at (800) 269‒7464. Thanks to David Gross for these contributions, which he has also written about (and more) on his Picket Line blog, sniggle.net/TPL. 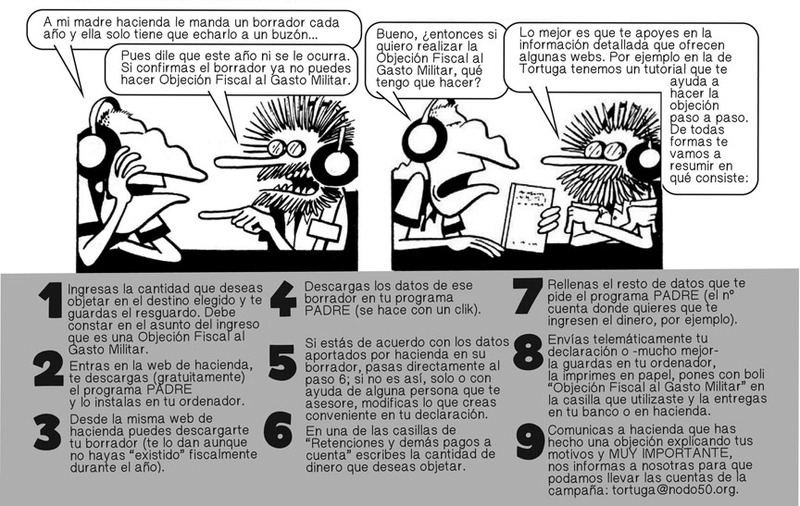 The panels below are excerpted from a 4-page comic book, “Todos Podemos Hacer Objeción Fiscal al Gasto Militar” from Grup Antimilitarista Tortuga. They have versions in Spanish and Castilian, which use two cartoon characters to explain how to file and resist war taxes. See their website, http://www.grupotortuga.com/Materiales-de-Objecion-Fiscal-al,23215, for the full version and a link to their how-to video. Graphic used with permission from Grup Antimilitarista Tortuga. While we often think of tax resistance mostly as a way of protesting against war or disassociating ourselves from it, tax resistance can also be a powerful alternative to war: a nonviolent form of “politics by other means.” A case in point is Burundi, which has been shaken by horrific, genocidal civil war in the recent past. A June 17, 2015, article in International Business Times reports that the political opposition is organizing a tax strike to put pressure on President Pierre Nkurunziza to stand for what they insist is an unconstitutionally excessive term of office. Let’s hope this gentler form of direct action catches on. In Honduras, where most of the population works in the underground economy, tax evasion is an especially valuable skill. Insurgent criminal groups have infiltrated the tax agency and use the tax rolls to exact a war tax from people in areas they control. So if you can stay off the lists, you may avoid persecution from both the government and the insurgents. But the government is cracking down and has also added a new criminal offense to the penal code — people who encourage, out loud or in writing, that people not pay taxes are subject to a three- to six-year prison term. The question arises, writes Jorge Colindres in El Canal, if there is criminal liability against those who distribute copies of the writings of Henry David Thoreau or Lysander Spooner, who promoted tax resistance as a means of protest against the policies of the State. The National Campaign for a Peace Tax Fund (NCPTF) and the Peace Tax Foundation (PTF) are seeking a part-time (approximately 24 hours/week) Executive Director to serve both organizations. NCPTF advocates for the enactment of a legal alternative for conscientious objectors to the payment of military taxes. PTF is its informational and educational partner organization. The Executive Director, based in the Washington, D.C., office, represents both organizations and is responsible for administration, lobbying, and fundraising. For more information, see the full announcement and job description at peacetaxfund.org, or contact(202) 483–3751 or info@peacetaxfund.org. Deadline for applications is October 15, 2015. Join war tax resisters, friends and supporters for the 30th annual New England Gathering of War Tax Resisters and Supporters over the weekend of October 16-18, in Amherst, Massachusetts. The program and most housing will be at Pioneer Valley Co-Housing. Everyone is welcome to attend — not just to celebrate but to join in exercises to revitalize collective action toward successfully meeting common objectives. The weekend begins on Friday with dinner, ends with lunch on Sunday, and will include a talk on community and resistance by Frida Berrigan. The brochure and registration form are online at nwtrcc.org/regional_local.php, or contact Daniel Sicken by phone, (802) 387-2798, or email, dhsicken@yahoo.com. If limiting government power by constitutional restraints doesn’t work, and if trying to influence elections to keep evil people out of office doesn’t work, what is left? Some would argue nothing. But, in reality the people can go on strike and refuse to finance or to fight in wars that have no legitimacy. If the authoritarians continue to abuse power in spite of constitutional and moral limits, the only recourse left is for the people to go on strike and refuse to sanction the wars and thefts. Deny the dictators your money and your bodies. If enough people do this, the time will come when the dictator’s power will dissipate. 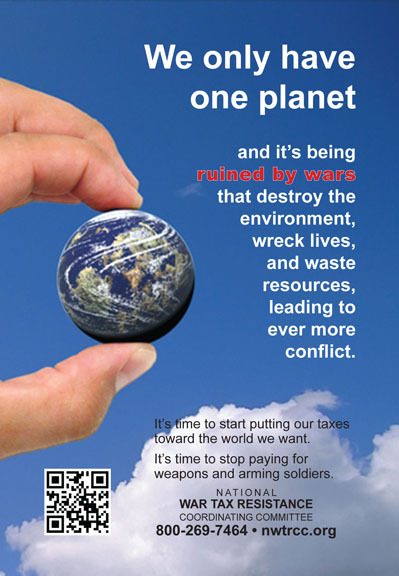 One variant of the peace tax idea would allow taxpayers who are conscientious objectors to redirect the portion of their federal taxes that pays for armaments and militaries to a new government-run Peace Institute that is designed to promote national security and international stability through nonviolent means. Sounds pretty good, until you realize that we already have a government-funded United States Institute of Peace, chartered to promote international peace through nonviolent conflict resolution. Hadley, formerly George W. Bush’s national security advisor, was appointed to the Institute of Peace by President Obama, recipient of the similarly ironic Nobel Peace Prize. Peace taxpayers may one day be able to pool their funds with Lockheed Martin, which made a $1 million grant to the Institute in 2009. The major news of the Mennonite Church USA convention June 30 – July 5 in Kansas City was adoption by the Delegate Assembly of the “Resolution on Faithful Witness and Endless War.” Among the action steps, affiliated congregations and staff are called to a renewed emphasis on trusting God and the way of Jesus, not violence, for our security, which included perhaps the most radical language of the document: “For this teaching to be effective, it must address our society’s commitment to the moral ‘necessity’ of violence, our government’s undisclosed purposes in its so-called ‘security efforts,’ and our often secret sympathies with so-called security operations.” Any group of people who follow these steps will find themselves at odds with the prevailing narrative! 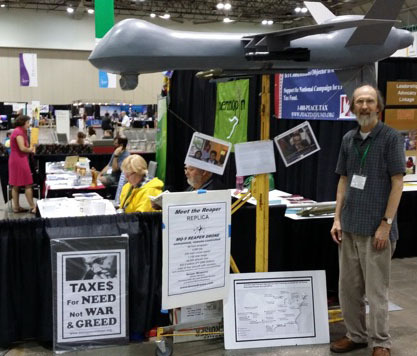 Richard Woodard, chairperson of the National Campaign for a Peace Tax Fund, staffed a booth in the exhibit area. He reported the addition of 92 new Congregational District contacts, which he said was the best sign-up record he recalled. The table disseminated NWTRCC and 1040 for Peace literature. Building off of the energy and success of the September 21, 2014, Climate March, the People’s Climate Movement, peoplesclimate.org, was formed to continue to build on that energy and excitement. In October (and hopefully continuing…) front-line communities impacted by the environmental crisis and climate change, are joining with workers, people of faith, students, immigrants, racial, climate and economic justice activists and other community members, to call for bold action on climate at the local, national and global levels. See their website to find out about actions in your area (or how to plan an action). And, be sure to take some of our “One Planet” cards with you to help highlight the connection to war’s devastating effect on earth. If you are making your own flyer and want some ideas, see the information and links at nwtrcc.org/environment.php. The full-color “One Planet” card is 4″ x 6″ with a blank back to add your local contact information or use as a postcard. The cards are free — just contact the NWTRCC office and tell us how many you want to use: (800) 269-7464 or email nwtrcc@nwtrcc.org. To order send a check made out to NWTRCC to PO Box 150553, Brooklyn, NY 11215, or pay online through Paypal (use the comment section to list your order or send an email). Call (800) 269-7464 with questions or for a resource list by mail. by Jennifer Carr, http://bit.ly/1OuzxoZ, and linked at nwtrcc.org. An academic paper that looks at the history of war tax resistance and the difficulties of conscience faced by resisters, then considers revisions to the current Peace Tax Fund legislation. Jennifer Carr is at the William S. Boyd School of Law at the University of Nevada, Las Vegas. She will be joining us on Friday night at the NWTRCC gathering November 6 in Las Vegas. The paper is published in the University of St. Thomas Law Journal, Vol. 11, No. 2, p. 183, Spring 2014, as part of the UNLV William S. Boyd School of Law Legal Studies Research Paper Series. You may be able to find a copy at your library. Please join us for a weekend of workshops, discussions, and presentations about refusing to support the war machine with our money. Friday evening and Saturday will include presentations and discussions about actions and organizing by war tax resisters, including legal cases, peace tax legislation, ideas for coordinated tax season actions in 2016, and a workshop for people new to war tax resistance and wanting to learn the how-tos. We’ll also hit the streets and vigil at a military facility in or near Las Vegas. More information and a registration form are online at nwtrcc.org/las_program.php, or call the office for a brochure, (800) 269-7464. Entitled “Peace & Reconciliation in the Pacific,” this four-day conference was packed with interesting workshops and scary updates from the “front,” where U.S. foreign policies promote war and destruction. Speakers including Ann Wright, Ray McGovern, Marjorie Cohn and Seymour Hersh laid out the back channel intrigue behind the current Japanese push for military power, Russia’s “invasion” of Crimea and the Ukraine, and the hidden hand of Saudi Arabia in the increasing violence around the mid-east and African countries. The plenary “From the Vietnam War to Perpetual War: How Popular Media and Political Messaging Feed A Culture of Acquiescence” examined U.S. cultural memes, looking for best strategies to feed a peace-oriented ethos here. Generally, United Statians* are more likely to engage in positive movements than in resistance. An essential part of creating peace lies within each of us; so we were asked to examine ourselves, and our own relations with larger groups, to build those values (and oases) of peace. The final emotional Reconciliation Ceremony offered testimony, forgiveness and compassion as essential elements of peace. Racism and sexism were front and center in several workshops and plenaries. The workshop “Courage to Exist” was especially haunting — a con- vergence of the dire fate of whistleblower Chelsea Manning and the rights of transgender people in “hyper-masculine” military and prison systems. We learned that conscientious objector status is also under attack in today’s military, suggesting that the federal government has become less receptive to CO rights (a troubling trend given WTR values). We were also challenged to build strong community support for resisters in real tangible actions. It was also a time of great networking as I got to meet local Veterans for Peace activists, the folks who create Arlington West, CodePinkers, a strong LBGT presence, and local producers of the progressive new radio station KNSJ and of movies like Zeitgeist. Establishing common ground was a main theme: How do we as participants strengthen the movement(s) across race, generations, and gender? Yet it was the intimate conversations at the NWTRCC table and during the WTR 101 workshop that resonated most. 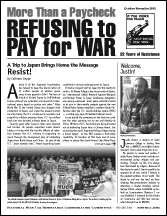 I met at least five “underground” war tax resisters, people who upon seeing our logo said, “I haven’t paid taxes since I was discharged …I cannot support any war.” They don’t file. These personal stories of individual resistance were very affecting. I got the chance to really talk up all the reasons why I am part of NWTRCC — the support system, the Penalty and Alternative Funds, the national meetings, its public presence — and why they should check us out. Several commented they would do WTR if it were legal — or if it didn’t involve the IRS! Some in our network have framed WTR as daily civil disobedience, and this resonated with folks in our workshop. War Tax Resistance is concrete — an action of conscientious objection, more direct than marching in antiwar rallies. As one veteran marcher joked, it could be the only time you are arrested without being tear-gassed. The following is not a scientific survey… but: Younger people showed real interest in direct WTR; older (non-military) folks were more interested in a Peace Fund and/or supporting the resisters. The older folks had worries about pensions, SSI, and health problems while the younger talked more about alternative economies and living off the grid. Perhaps NWTRCC should create a “supporter” level of member, with literature explaining how sympathetic supporters can actively support resisters — letters to government and to media, support our funds, help a resister, etc. I left with a long list of insights to share at the next NWTRCC gathering. Anne Barron is a war tax resister and is a member of Women Occupy San Diego. She redirects her taxes to support the 99%. We were sorry to hear of the death of Bruce Graves on June 26, 2015, in Michigan. As his obituary notice in the Ann Arbor News noted: “He was active in the peace movement, particularly focusing on establishing the possibility of conscientious objection to taxes for war. The latter effort resulted in a case that reached the Supreme Court.” He and his wife Ruth, who survives him, argued in court for a legal validation for claiming a “war tax credit” on their federal returns. Their final appeal to the Supreme Court was refused in June 1979. Friends Journal wrote about the case at the time, and documents about it can be found through an internet search. Conscience & War Celebrates 75 Years! This year, 2015, the Center on Conscience & War (CCW) celebrates 75 years of work in defense of the rights of conscience. For many of those years, NWTRCC has been a friend and partner. In draft time, CCW supported those who resisted conscription to war. Our work now is with active duty members of a voluntary military who, after a change of heart, inspired by a crisis of conscience, seek discharge as objectors to war. I am happy to report that military conscientious objection is alive and well. CCW‘s caseload of conscientious objectors (COs) is as high as it’s been in recent memory. It is our great privilege to work with these newest peacemakers, who have fixed the opposition to war in their hearts through experiences most of us, fortunately, will never share. What we have learned in three quarters of a century of doing this work is that humanity is predisposed to peace: the default position for humanity is conscientious objector to war. Our conscience tells us killing another human being is wrong. And it is the military that knows this better than anyone. In order to get an otherwise psychologically healthy individual to kill, U.S. military training has been developed to bypass the conscience and have the act of killing — the act of firing one’s weapon with the intent to kill — become reflexive. When we take the time to think — to filter through the conscience — we make better decisions. And in the case of war and killing, the vast majority of us already have decided. In fact, 99% of us have decided by default that we will not choose to kill. The military comprises less than 1% of the total U.S. population. When you add veterans to that number, it still only creeps up to 7%, and some of them, of course, had been drafted; they didn’t volunteer to join the military. The act of paying taxes has become (by design?) something that is done not only reflexively, but automatically for employees — the money is taken out (and nearly half of it spent in support of war) before it is even ours. It takes an extra leap of conscience to find out about the W-4 resistance practiced by war tax resisters. Considering that 99% of us have exercised our choice not to use our bodies for war, for many the result is that our dollars are being conscripted to allow someone else to do what we ourselves already have refused to do. And those who take our place and kill in our stead, if not our name, are just like us — their consciences oppose killing, too. I have heard, even from members of the peace movement, that “people who join the military are different from me — they can kill; I can’t kill.” The truth is, they can’t kill either — not without consequences. Military training dulls the conscience, but not forever. The conscience will come back, and when it does, for many, the result is trauma — moral injury — wounds to soul caused by a transgression against the conscience. Yet the myth persists — war is inevitable because violence is natural. And so the predictable response is to doubt the conscientious objector’s sincerity. In the course of our work, we are often asked, “Why have empathy for an individual who joined the armed forces voluntarily and now decides he or she cannot fight, cannot kill? Didn’t they know what they were signing up for? Didn’t they know that the purpose of the U.S. military is to fight wars? The answer is no, they didn’t, because as a culture, we fail to have an honest discussion of the realities of military service and war, of what it means to kill, and because of the myth of human violence, which is endorsed by the major pillars of our society: our government, our media, our schools, and even our churches. This is why the work of NWTRCC for 33 years, of the Peace Tax Fund for 43 years, of CCW for 75 years, among many others, is so critical. With our witness of conscience, we wage an active challenge to war — one soldier and one dollar at a time. Maria Santelli is the Executive Director of the Center on Conscience & War. Contact the Center at 1830 Connecticut Avenue NW, Washington, DC 20009, 202-483-2220, or on the internet at centeronconscience.org. The Fund for Education and Training (FEAT) assists young men who for reasons of conscience do not comply with laws requiring registration for the draft. Nonregistrants are ineligible for enrollment in federally funded job training programs and for federal and some state financial aid programs for higher education. In an effort to alleviate the effects of these penalties, FEAT provides low interest loans to nonregistrants of conscience who have a demonstrated financial need. NWTRCC is an endorsing organization of FEAT. For information on FEAT, contact CCW or visit our website: centeronconscience.org/event-schedule/fund-for-education-and-training.html.